You see, sentences like, “I don’t like that,” and, “I don’t want it!” can frequently be heard from him at dinner time. Not being such a big pea-fan myself, I was almost certain that Smarty Pants would pick the peas out and leave them aside. Green stuff in general doesn’t go down too well with him. Well, to my pleasant surprise, I was wrong. 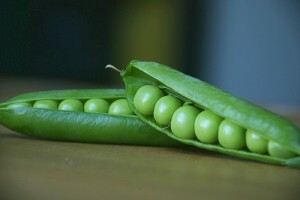 When Smarty Pants saw the rice with peas, he took one look at the peas and exclaimed, “Green berries!” Hey, great concept! I thought, and went along with it of course…. “Yes, green berries, yummy green berries!” I replied. Who says they need to be called “peas” anyways? We’re allowed to use a little imagination here and there as parents, aren’t we? This little episode got me thinking about a German cartoon we were watching a few days back. The cartoon featured a brother who was trying to convince his sister to eat things she didn’t like, like carrots, mashed potatoes, and fish sticks. He told her the carrots were rocket ships from Jupiter, the mashed potatoes were puffs of clouds, and the fish sticks were mermaids’ favourite foods. She got excited about the foods, given this new information about them, and ate them. I haven’t tried any of those “convincers” with Smarty Pants, but all of this has planted a seed in my head (or maybe a pea). I don’t like the idea of lying to my kids, and I wouldn’t feel comfortable convincing Smarty Pants that carrots are really rocket ships from Jupiter, but I do like the idea of making food more interesting to him, and making him more excited to eat (or at least try) certain foods. I also don’t have a problem telling Smarty Pants that the food is his favourite storybook character’s favourite food. It’s not really lying, it’s just extending the story, or giving the character a few more characteristics. Maybe it really is the character’s favourite food, for all I know. In any case, a little creativity and imagination can sure go a long way in the uphill battle of getting a picky eater to try some new foods. Do you have any ideas for how to get a picky child to eat or try new foods? Share your ideas and tactics with us here! I love Green Berries!children have the best imagination, without any pre-determined social words. We are very fortunate in the fact that our oldest daughter is a great eater. She actually ate some sauerkraut last night. She doesn’t always eat a lot but she at least tries everything on her plate. Now, my neice is a super picky eater and she’ll only eat peas, fish sticks and chicken nuggets. My sister-in-law has resorted to taking her daughter to an “eating club” where kids get together and they are served different foods. I guess the peer-pressure from watching other kids eat will help your kid eat. I think that’s why our daughter is such a good eater because she’s seen so many kids eat all types of food every day since she was 3 months old. But, I don’t think lying to them to eat a balanced diet is that bad. The good you are doing outweighs the bad. I was blessed with toddlers who ate pretty much everything. Because they are so willing to eat most things, I feel better about not making them eat the few items I know they really don’t like. Emily detests green beans, has even as a baby, and I am so glad my mother is not force feeding me brussel sprouts anymore so I serve them with something else. Our rule is to have a “no thank-you” bite. They must try one bite of a new food and if they don’t like it they can say “no thank you”. We try the same food four or five times with a no thank you bite and sometimes they actually change their mind. On that note, Emily is now going off meat which I am not a big fan of either, now finding vegetarian meals we can all enjoy, now there’s a challenge! @Tyler: that is great that your oldest daughter tries everything. Smarty Pants tries things if they look good, but if something looks slightly dodgy in his eyes, he will just outright say, “I don’t like it!” What you say about the influence of seeing other kids eat things is interesting. I think the reason it works is because when they see other kids like them (especially if it is a friend) eating certain things, they might figure that those things must taste good. The idea I mentioned in this jam about using a favourite storybook character is similar…the kids think that character likes the food, so they want to try it too. The other night, Smarty Pants didn’t want to eat his dinner cuz he said he didn’t like it. I told him that the food on his plate was Winnie-the-Pooh’s favourite food. He looked at me and asked, “Winnie the Pooh likes it?” and I said, “Yes.” Right away he tried it and liked it! @Treemama: also great for you that your kids ate everything as toddlers. I like the idea of the “no thank-you” bite rule. Thanks for sharing it. I will give it a try. I am also into trying the same food a few times, and it works. Sometimes you just have to serve something in a slightly different way or with a slightly different presentation, and then they will eat it. We also don’t eat a lot of meat, and Smarty Pants doesn’t really like meat. To find some good vegetarian meals, I recommend Veggie Works: Vegan Cookbook by Mark W. Rasmussen. Although it is a vegan cookbook, and we are not vegans, there are a lot of great recipes in there and it is very informative and comprehensive. @Cici – absolutely! It is amazing to hear the things they come up with. Things that are so obvious to them, but that I would never think of on my own. @Treemama: I love the “no thank you” bite idea. My mom always made us take “two bites” of everything on our plate. She figures if you really don’t like it after the second bite then you don’t have to eat anymore. Sounds a lot like your idea and one bite might be more tolerable if your child really doesn’t like something. Tyler @ Building Camelot’s last blog post..Who’s More Important: Your Spouse Or Your Children?